Welcome to our hotel located opposite Parc de Saint-Cloud! 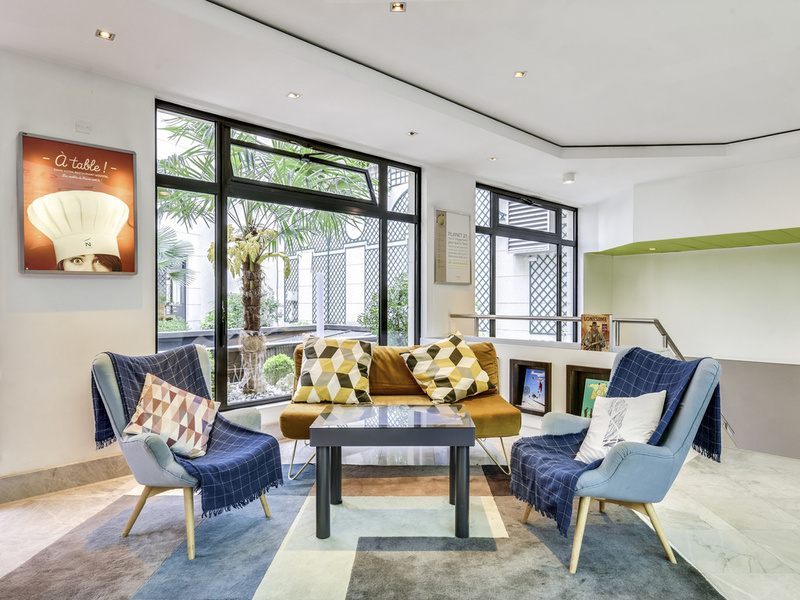 Easily accessible by car or public transport and ideally located for your professional events, as well as visiting Paris and the Palace of Versailles. Spacious, contemporary rooms await at the Novotel Paris Pont de Sèvres hotel. The hotel offers children's play areas so you can have fun as a family. A web corner, free WiFi and 10 modular rooms are available to help ensure the success of your professiona l events. Spend time with friends or colleagues enjoying the friendly atmosphere of the hotel bar and restaurant. After a day keeping up with the rhythm of the capital, take a moment to relax at Novotel. METRO : METRO Ligne 9 Station "Pont de Sèvres"
Spacious, contemporary design and adaptable, the Novotel room is truly a place for living. Perfect for all your needs. Choose an Executive Room and enjoy the bathrobe, slippers, Nespresso coffee machine and free minibar service. Hotel was outdated, no one spoke English, location was in the middle of nowhere, rooms were small. There was no bathtub for the little ones, just an moldy shower. Refrigerator in the room did not work, A.C did not work as well. Upon checkout I got charged $500 e.u for a breakfast we didn’t eat, didn’t get my money back until I expressed my concern with Travelocity. Convenient hotel for office and park. Comfortable bed in quiet location on rear side of hotel. Small room, not enough storage space or place to work. Air conditioning didn't work. Breakfast good but evening restaurant average. One of the check in staff was really slow. Others helpful. Small and old rooms. Very inefficient service at the restaurant. Incorrect invoice issued. The room standards is closer to Ibis budget than Novotel. Restaurant food was not nice. Impossible to eat steak it was so hard. I was waiting at least 1h to get my food and 30 min to place an order. Incorrect invoice was issued at the end and has to be corrected. Very pleasant and supportive staff. After some initial problem due to reservation not found in the hotel booking system, all was fine. Very good hotel with good guest rooms. Breakfast however needs improvements. It was the first time I stayed in the same hotel as other colleagues, where my company was hiring the facilities for business meetings. I lounge feel to the bar. The breakfast was great. The hassle free check out was nice. The hotel is classed as &quot;Four Stars&quot; at the entrance. We have travelled all over the world and it is not in that class. On arrival, the room was pokey, a towel was dirty (changed with apologies, very quickly). The air conditioning appeared not to work (the room was very hot, and remained so despite setting the aircon to 15 degrees), there was no plug for a razor/tooth brush. The carpet in the corridor was scruffy. The breakfast was adequate but not luxurious - fresh bread and condiments but the cereals were the sort of disgusting chocolate based boring and unpleasant rubbish which the Europeans seem to like to offer US tourists - there was no genuine Muesli - however, the coffee was excellent! My room was clean and spacious. Enjoyed the coffee/tea facilities. Breakfast was better than expected. I would stay again. I always love my stay at the Novotel Sèvres. It is a simple hotel but everyone from the reception staff to the barmen to the maids make me feel comfortable and secure when I travel for business. After a long day I enjoy coming back to my room, perhaps enjoying a snack in the bar and then settling down to sleep well. usually it is great as I stay here often. this time I had a concierge/check in person be very unhelpful and condescending . Stay was ok, however there're 2 remarks : => Rooms are very hot , i've had difficulties to sleep at night due to no air => final note included too many extra lines - breakfasts we didn't eat; tourist fee for 4 people (we were 2 in the room). If for breakfast i got reimbursed, for tourist fee still waiting for a resolution as saw it after paying and leaving (at the time of doing my expense report). We stayed in very clean room, the staff was very kind. The location near bus station is useful. The scenery of the Sèvres bridge located just half mile is an interesting attraction. Very good dinner. Not so good room. The hotel rooms needs upgrade.